I read every night before I fall asleep for about 30 minutes (it depends on how tired I am). As a result, this year I read 17 books, and none of them were misses. In fact, almost every book on my list has at least a 4.5 on my 5-point scale. Maybe I need a new scale. So many of these books fit into series I started this year that I’m going to group them together. Also, please note that I am still making my way through Brandon Sanderson’s Oathbringer. Otherwise it would have been on the list. An Ember in the Ashes by Sabaa Tahir (2 books so far): For a long time I’ve been looking to fill the void that Harry Potter left behind in young adult fiction, and finally this series came along. It’s familiar but otherworldly, and the shifts in perspective are superb. Attrition: The First Act of Penance by S.G. Night (1 book so far): This fantasy novel is infuriatingly several reasons. First, it was written by a teenager–to have such skills at such a young age! Second, it was released in 2013, and there’s no sign of book 2. It may never happen. But I really, really hope it does. The Collapsing Empire by John Scalzi (1 book so far): You know, I have this listed as part of a series, but I’m not 100% sure that’s true. I think that’s one of the signs of a good book, when it stands by itself but could be expanded. Scalzi is one of my favorite science fiction authors, so I’ll read anything he writes, and it’s nice to see him explore a new universe. Age of Myth by Michael J. Sullivan (2 books so far): This epic fantasy series is so big that I almost didn’t read it. It was dauntingly large. But I’m glad I did, because the scope of the mythology is incredible. There’s Age of Myth and Age of Swords, and then you can read the Riyria trilogy, which takes place thousands of years in the future, a time when you and the characters look back on the Age of Myth books as actual myths, legends, and history. It’s really impressive. Waking Gods by Sylvain Neuvel (2 books so far): After enjoying but not loving the first book in the series, Sleeping Giants, I wasn’t sure if I’d read more. It’s a modern epistolary novel, so the entire story is told through “reports” and “transcripts.” Sometimes I just want the author to tell me what’s happening. But the core story about humans discovering ancient, buried mechs is good enough to keep me reading. 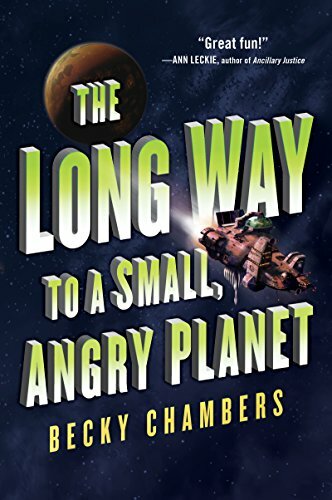 A Long Way to a Small, Angry Planet by Becky Chambers (2 books so far): As you can tell from my linked review, I love, love this book. The characters, the worldbuilding, the plot, the humor…everything just comes together into what I want in a science fiction novel. We Are Legion (We Are Bob) by Dennis Taylor (3 books so far): I’m always dubious when Amazon offers a book for free, but this book about a human brain embedded into a self-replicating computer/spaceship proves my doubts wrong. The vastness of this series is incredible. Artemis by Andy Weir: This is the only novel not in a series that makes my “favorites” list this year. I love how Weir’s science background translates into books that feel like the could happen in the very near future–the story feels like an actual account of something that will happen, just like The Martian. The Language of Thorns by Leigh Bardugo: Every now and then I just want a book of short stories, especially given my reading habits. This is a slim tome, but it’s an excellent collection of stories. They feel like the type of old fables you may have read as a kid, except these are new creations. With that list in mind, my pick for book of the year is….A Long Way to a Small, Angry Planet. If you can only read one book from this list (which hopefully isn’t the case, because these are all excellent books), that’s the one. This entry was posted on Monday, December 25th, 2017 at 6:31 pm	and is filed under books, favorites and tagged with books. You can follow any responses to this entry through the RSS 2.0 feed. I’m glad to hear you’ve enjoyed Mistborn! The first trilogy is one of my favorite trilogies ever…so good.